Feeding America is the nation’s leading domestic hunger-relief charity. Feeding America’s mission is to feed America’s hungry through a nationwide network of member food banks and engage the country in the fight to end hunger. Feeding the Carolinas is a Partner State Association of Feeding America, working on behalf of the network’s affiliated food banks. North Carolina and South Carolina VOAD is a coalition of nonprofit organizations that respond to disasters as part of their mission. The Carolina’s VOAD is a statewide body that facilitates cooperation, communication, coordination and collaboration of member organizations in all phases of disaster and that maximizes member impact. VOAD is the forum where organizations share knowledge and resources throughout the disaster cycle—preparation, response, recovery —to help disaster survivors and their communities. As members of VOAD in the Carolinas, we coordinate our network’s resources to assist the states in disaster response and recovery. 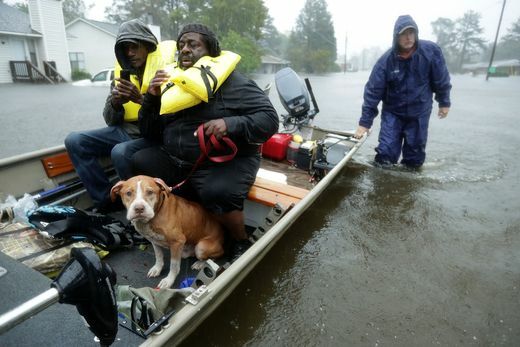 Volunteers help rescue residents and animals during Hurricane Florence September 14, 2018 in New Bern, North Carolina. The North Carolina Legislature – For many years the North Carolina legislature has provided funding to the six food banks in the state. The Funds flow through DHHS and are earmarked for the purchase of healthy food for those in need in all 100 counties of North Carolina. North Carolina State Employee’s Credit Union – SECU in North Carolina has supported the NC food banks for the past several years. Their support has helped provide tens of thousands of pounds of produce throughout the state.